You are here: REDWOLF > Home > News >News Detail - Congratulations to our winners! Congratulations to our winners of the Olympic Shooting Voting Contest. You were asked to vote for which country you thought would win the men's and women's 50m Rifle, 50m Pistol, and Women's Trap Final. This was a tough one since these are not your usual winners! Only 3 lucky RedWolf members voted correctly. Here's what you win! We will be contacting you by email to notify you of your win! Good job! The Summer has begun and the London 2012 Olympics will soon be underway! Are you going to watch the shooting events? If not, you should be because we have something special coming your way. A Summer sale that ties in with the Olympic pistol and rifle shooting events. 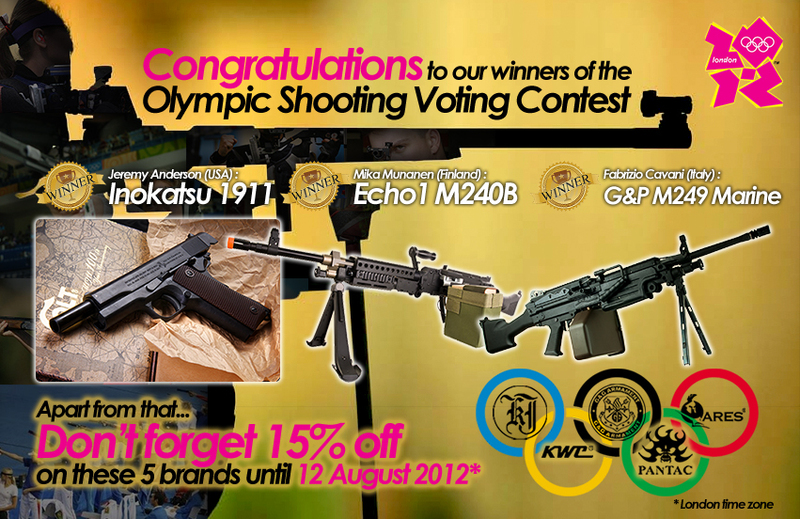 First of all, we would like to mention that all our Redwolf customers will get a 15% discount on these 5 brands which include G&G, ARES, KJ, KWC and Pantac on all their available products. This sale will be start and end on the same days as the Olympic’s opening and closing ceremony from the 27th of July to the 12th of August (London Time).